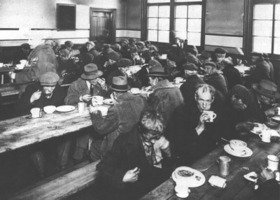 1 This soup kitchen in Montreal in 1931 fed many unemployment victims. 2 What do you know about the Great Depression? Many people think it started in Canada the same time it started in the United States. Some think it started earlier. 3 For most people, the Great Depression began when the stock market collapsed late in 1929. The western provinces' wheat farmers were hurt worst of all. Farmers couldn't even get the cost of growing the grain from the price that was offered. That didn't include having money left over to pay taxes, loans, or to feed families. British Columbia was not hurt so badly. It had some industry, in addition to fishing, mining, timber, and fruit farming, to help employ its people. Even so, times were tough everywhere in Canada.